What a great night! Food, friends, music, awards — and BOOKS! 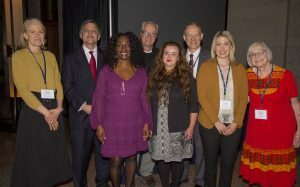 Once again, we gathered in the Atrium of the Ohio Statehouse to honor the recipients of one of the oldest state literary awards in the nation. We were only missing author and speaker J.D. Vance, who had a previous engagement, but he created a wonderful video for us. There was a surprise video visit, however, from author and Governor John Kasich, who showed his appreciation for the authors and for the literary heritage of the state.